The Yamaha Stage Custom has never looked sounded or felt so good! The Yamaha Stage Custom Birch 5 piece shell pack is an updated and redesigned edition of this classic drum series. With all birch 6ply shell and Y.E.S.S. 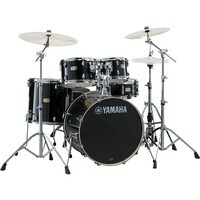 (Yamaha Enhanced Sustain System) this is a great choice when purchasing a drum kit. Enjoy the brightness and attack of 100 percent birch shells and fall in love with the tone of these shells. Featuring a 22 kick drum snare two quick toms and a floor tom this drum kit does not include cymbals. This Custom Birch kit features a classic Raven Black finish. This entry was posted in Yamaha and tagged Drums-and-Percussion. Bookmark the permalink.